It's a book of maps rather than an illustrated bird species reference guide. With a rich variety of stunning avifauna, Mexico provides the first taste of the Neotropics for many birders. At last here is a guide to Mexico’s best birdwatching sites, from Baja California to the Yucatan Peninsula. Steve N. G. Howell, coauthor of the widely acclaimed A Guide to the Birds of Mexico and Northern Central America, has selected over 100 sites where birders may see more than 950 species, including virtually all of the endemics and regional specialties. 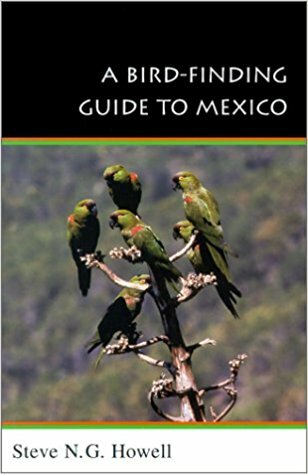 Useful for both the business traveler in Mexico City with only a morning to spare and the serious birder planning a three-month trip across the country, this indispensable book tells where to go and what to look for. * covers all of Mexico and includes all of the top birding spots. * presents key information on over 100 sites, where more than 950 bird species can be seen. * provides lists of the birds at the most popular sites. * gives general information about each region of the country, along with a map showing the location of its sites; additional maps show greater detail at selected sites. * supplies listings of all endemics and sought-after species with key sites where they can be seen. * includes advice on how best to find and view birds. * suggests itineraries for birding holidays. * offers valuable tips on travel and birdwatching in Mexico.